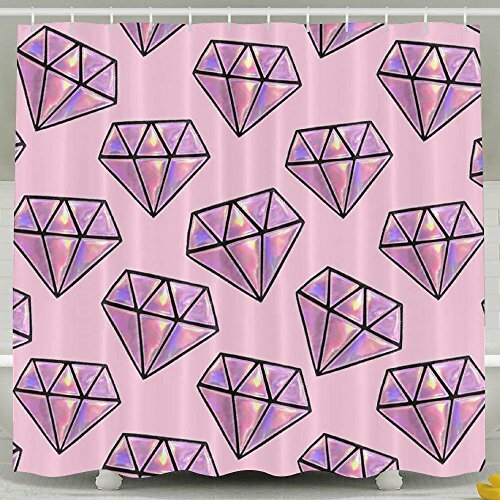 Our Top Quality Custom Made Shower Curtains Will Personalize, Beautify And Add A Unique Style To Your Bathroom. The Image In This Listing Shows Our Print. Made From A High Quality Polyester Fibre Making It The Ideal Shower Curtain! The Beautiful Polyester Shower Curtain Is Sure To Make Your Bathroom Space Look Appealing. Featuring A Lavish And Elegant Drape, This Shower Curtain Has An Attractive Ruffled Texture And Solid Pattern Which Adds To Its Aesthetic Appeal. It Can Be Spread Around The Tub To Prevent Water Spillage Onto The Bathroom Floor. The Polyester Shower Curtain Is Made From Polyester To Ensure Durability And Reliability. This Polyester Shower Curtain Has 12 Hook Holes For Curtain Rings To Be Fastened, Making It Suitable For Different-sized Curtain Rods. Lightweight In Nature, The Curtain Can Be Hung On The Curtain Rods Or Removed With Ease And Moved To Another Bathroom, If Required. You Can Fold This Shower Curtain And Store It In A Bathroom Cabinet To Use As And When Required. The Polyester Shower Curtain Is Easy To Install And Easy To Use. It Can Blend Well With Chic Bathroom Decors. Easy To Maintain, This Curtain Only Needs To Be Dry Cleaned Occasionally To Keep It Looking As Good As New For Years To Come. View More In Shower Curtains, Hooks & Liners. If you have any questions about this product by BINGO FLAG, contact us by completing and submitting the form below. If you are looking for a specif part number, please include it with your message.